Constructed in the High Tang period, this cave has a truncated pyramidal ceiling. The ceiling center features a medallion pattern composed of flowers and clouds and draperies. The draperies extend to the four slopes covered with the thousand Buddha motifs (partly damaged). 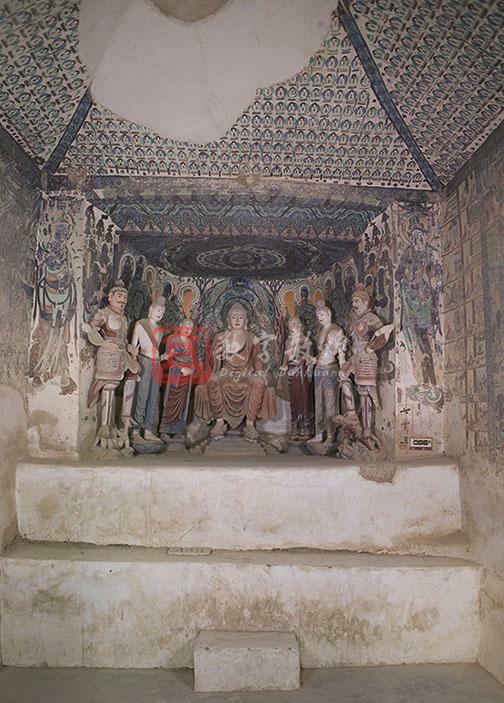 A niche with a flat ceiling in the west wall contains a seven figure group made in the Tang dynasty and repainted in the Qing dynasty. The ceiling is decorated with a parasol and lotuses. Each of the north and south sides out of the niche depicts a Bodhisattva. The south wall is covered with a western pure land illustration, the middle and lower parts of it was damaged. The north wall is also covered with an Amitayus sutra illustration with two side scenes respectively for the Sixteen Meditation and the story between Bimbisara and Ajatasattu. The lower part is lost. Most of the east wall has collapsed, ony a few images of the thousand Buddha motifs have survived on the north side of the entrance. Most of the east wall has been damaged, only a few images of the thousand Buddha motifs are preserved on the north side of the entrance. A western pureland illustration (the lower part is damaged) is painted on the south wall in which the central seated Buddha is flanked by Avalokitesvara wearing a crown with an incarnated Buddha on the left and Mahasthamapprapdta on the right. Around them are a few bodhisattvas. Above is a parasol, and the upper-central parasol contains a scene of a Buddha and a bhiksu standing face to face under a parasol. On both sides are manifested Buddhas, apsaras, attendant bodhisattvas and Kalavinkas. There is a niche in the west wall housing a seven stucco figure group: one Buddha, two disciples, two bodhisattvas, and two lokapalas. Each of the lokapalas stands on a yaksha. On the flat ceiling of the niche is a parasol decorated with lotuses, flanked by three apsaras on either side. On the west wall inside the niche are aureoles in bas-relief, and on the two sidewalls are respectively four disciples, two bodhisattvas and four musicians. The brim of the niche is decorated with flower motifs. A bodhisattva is painted on either side out of the niche, and the one on the south side wears a crown with an incarnated Buddha and holds a lotus stem in hands. The other on the north side wears a bottle-like crown and stands on a lotus with an inscription on his right side, which reads: "salvific Avalokitesvara." An Amitayus sutra illustration is painted on the north wall, in which the pure land is in the center, and the two side scenes consisting of regular squares are the Sixteen meditation (on the west side) and the story of Bimbisara and Ajatasattu. The lower part is lost. Amitabha sits in the center of the pureland on a lotus throne flanked by standing bodhisattvas, namely Avalokitesvara wearing a crown with a manifested Buddha image and Mahasthamapprapdta wearing a bottle-shaped crown. A Buddha who is welcoming the soul of the dead is painted in the lower right corner of the pureland (damaged). The east side contains the scene of Prince Ajatasattu launching a mutiny, imprisoning his father King Bimbisara, Queen Vaidehi visiting the King, and the guardians reporting to the prince from top down. The west side from top down includes the scenes of sixteen meditations on the sun, water, the earth, and the trees.